Stepping stone walkways help transform an ordinary path into a more natural and inviting trail across your yard or garden. A stepping stone walkway should take less than a day to install completely, regardless of whether you lay the stepping stones alone, or surround them with a gravel border. This process is so easy that any child strong enough to help lay the stepping stones can help you with the project. Rake the area where you wish to place the stepping stone walkway to remove gravel and twigs from your work area. Set the stepping stones into place on top of the grass, to assist you in finding exactly how you wish to place the walkway and how far apart to set the stones. 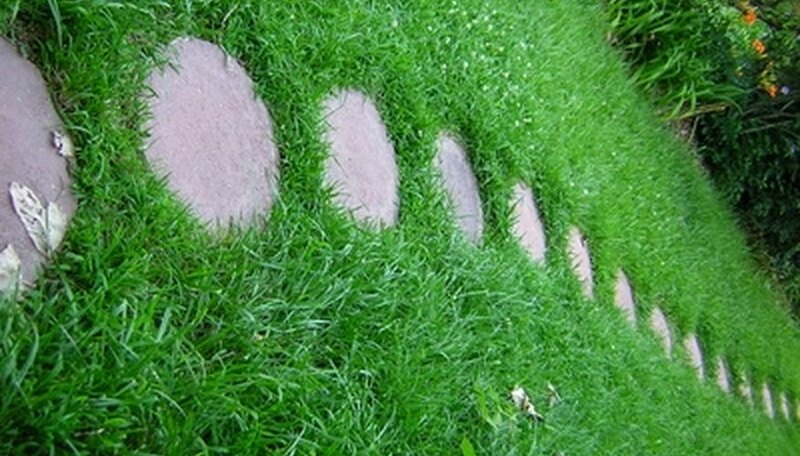 Walk across the stepping stones to ensure they are spaced properly for the various strides of your household members. Though stride length varies, an ideal measurement for the distance between stepping stones is between 10 inches and 14 inches. Push the spade into the ground directly around each stepping stone, outlining each stone before lifting the stone out of place. Use the grooves punched in the ground to guide you in removing only the amount of sod necessary to place each stone. Set the stones into their corresponding areas and tamp each stone down into the ground by stepping and walking on the stone. Make sure the stone sits directly against the ground and does not wobble or lift under foot traffic. Surrounding the stepping stone pathway with gravel promotes drainage in your pathway and prevents muddy areas around stones. To do this, dig out an area in the intended width of the pathway, then set the stones into place and pour gravel into the remaining open area and between each stepping stone.